But I also knew that "the thief cometh not, but for to steal, and to kill, and to destroy" (John 10:10), so I told the enemy, "I'm going to church in spite of how I feel!" At the service that evening, I thought, "Oh God, just don't let anybody talk to me. I want to be left alone!" When the worship service began, every song ministered to me. I joined in praising and worshipping the Lord and my spirit lifted. By the time my husband started preaching the Word, I was receptive to the message and was blessed. When church ended I left rejoicing, strengthened in the Lord. What happened to me during that service? I changed my garment. I'm not talking about a physical garment. I exchanged the "spirit of heaviness" weighing me down for the garment of praise (Isa. 61:3). When we put on the garment of praise, the joy of the Lord covers us like new clothing. As we come to Him with praise, He gives us joy. But if we're not careful, the circumstances in life can cause us to revert back to that old garment of heaviness. The Lord may bless us, but we take His blessings for granted and forget to thank Him for what He has done for us. Or we begin to have some kind of trouble and worry about it. We stop praising God. Before we know it, we've lost our joy. At those times we need to get down on our knees and have a prayer meeting—just us and the Lord. We need to start praising Him. We'll come out joyful because we will receive into our spirits what I call "spiritual vitamins" that will energize us. We'll have a new spring in our step because we're charged up with the power of God. Are you worn out by the cares of this world? Has it been a long time since you expressed your appreciation to the Lord for all He's done for you? God wants to give you a new garment—the garment of praise—for that heavy spirit! I determined a long time ago that I wasn't going to lose my joy anymore. I'm so stirred up about praising God that it has to come out or I'm going to burst! We are coming into an era when it will take intense prayer and reaching the heart of God for us to live victoriously in this world. How do we do that? We begin by putting on our garment of praise—giving praise and worship to the Lord. 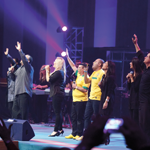 We may praise God with heartfelt words of thanks, or we may sing or play worship music. Either way, praise is the vehicle that ultimately puts us in touch with our Heavenly Father. There's an old saying that "when the praises go up, the blessings come down." Yet more than that, through praise we enter into the very throne room of God! Don't let your Christianity become just a way of life. God wants it to be a joyful experience! He is saying in Isaiah 61:3, "My child, I have given you a new garment, the garment of praise. Put it on and rejoice in Me!"